Tokyo Grill is walking the same fast-casual line as places like Panera or Chipotle – better than fast food, but more casual and affordable than other Japanese restaurants in town. They've got a nice dining room, but their primary business seems to be take out. Several parts of my meal (but not all of it) were served in to-go containers, which seemed a little weird for dining in, but it made packing up the leftovers easy. And I had a lot of leftovers, mostly because I ordered way too much food. Tokyo Grill's menu is extensive for such a small restaurant, and my friend John and I had a hard time choosing. We were the only people in the restaurant, so the waitress came and took our order very quickly. When we weren't able to make any concrete decisions after asking for more time, I just started ordering things. We started with an order of crab rangoon. I know that crab rangoon is fairly standard, but whatever wrappers Tokyo Grill used were better than most. They were perfect little crispy fried triangles filled with sweet cream cheese and crabmeat. We also got sushi – a Spider Roll (on the server's recommendation) and a deep-fried Yummy Roll. Both rolls were good and fresh, but not spectacular. 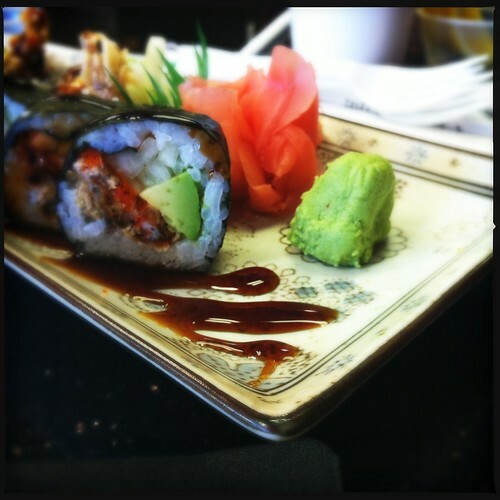 On the Memphis sushi spectrum, they fall somewhere between gas station sushi and Ryu. The best thing we ordered, though, was the Pine Nut Tuna. When I placed the order, I wasn't exactly sure what I was getting – it was listed as coming from the sushi bar, but didn't mention any kind of roll. 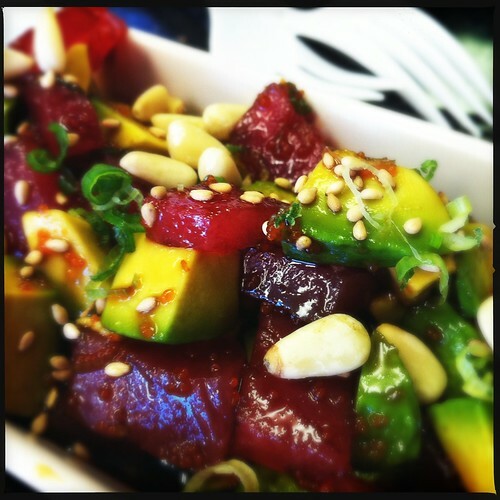 What I got was a long dish of cubed raw tuna and chunks of fresh avocado, topped with a soy-based special sauce and sprinkled with pine nuts, sesame seeds and roe. It was sort of like Japanese ceviche. I ate it with chopsticks, but next time, I'll probably take it home, make some wonton chips and eat it like salsa. Tokyo Grill is open daily from 11 a.m. until 10 p.m.
when I asked the reply was "glue?"